Using maple syrup instead of honey was a great idea. We first browned the chicken in canola oil and butter. Then we added maple syrup, dijon mustard, chicken stock, garlic and soya sauce. It cooked in a dutch oven for about 1 hour at 400°. The dutch oven is one of of our favourite ways to cook meat. It makes the meat extremely tender. 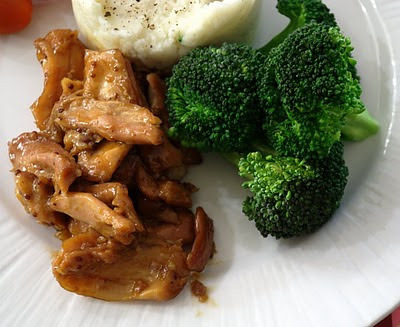 This recipe was very easy to make and if you don't add a lot of maple syrup like we did, because we love it so much, it can also be very healthy.